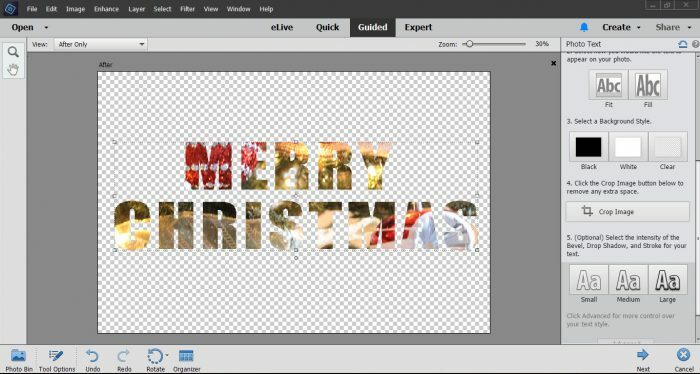 Learn how to create holiday cards using Photoshop Elements. This easy tutorial will help you make a beautiful custom card in minutes. 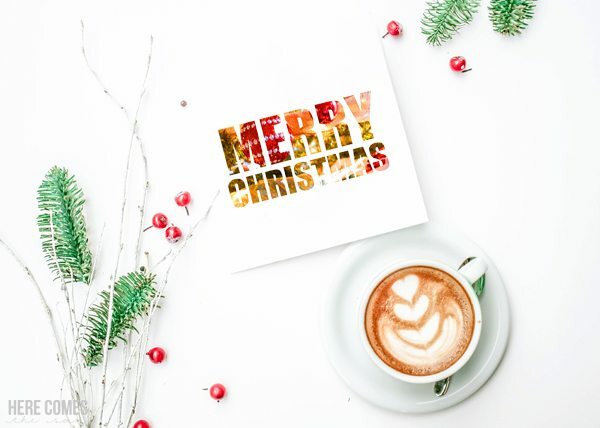 Have you sent your holiday cards yet? I have to admit I’m a little behind on mine. 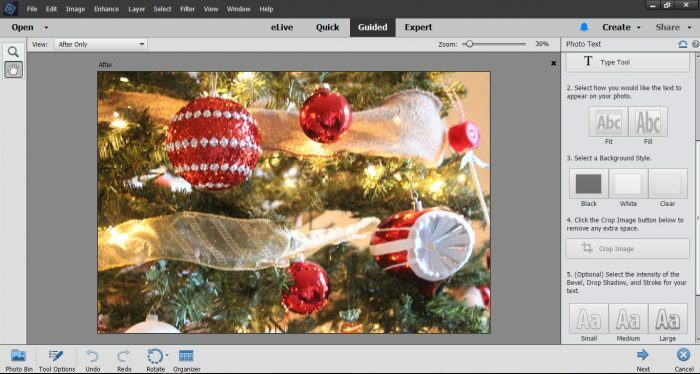 Have you ever tries to create holiday photo cards? It’s so easy using Photoshop Elements. Thank you to Adobe for sponsoring this post. Photo editing can sometimes seem overwhelming but Photoshop Elements makes it super easy. As you know, I’m a huge fan of Photoshop Elements and use it for just about everything from photo editing to designing graphics. 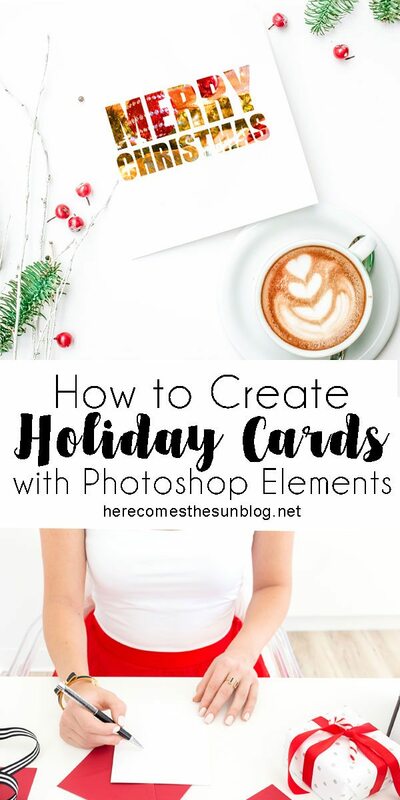 Today I’m going to show you an easy way to use Photoshop Elements (PSE) to create holiday cards. There is a video tutorial at the end of the post too so you’ll want to check that out. First, you’ll need Photoshop Elements. 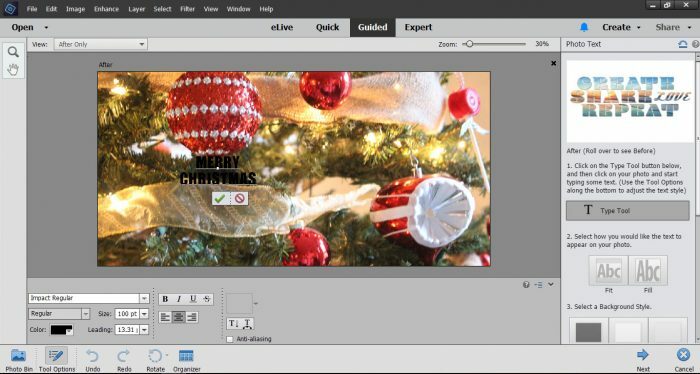 I’m going to be showing you how to use the Guided Edits feature in Photoshop Elements. I’m using version 18 which is the latest version of the software. 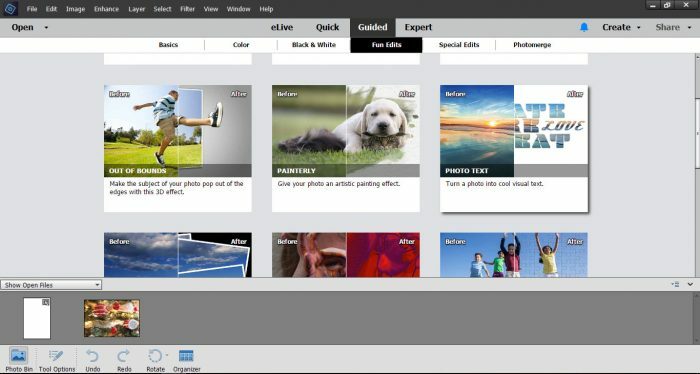 Guided Edits basically takes a process made up of several steps and condenses it into a few clicks of the mouse, making the process easy peasy. Did I mention that the results are stunning? 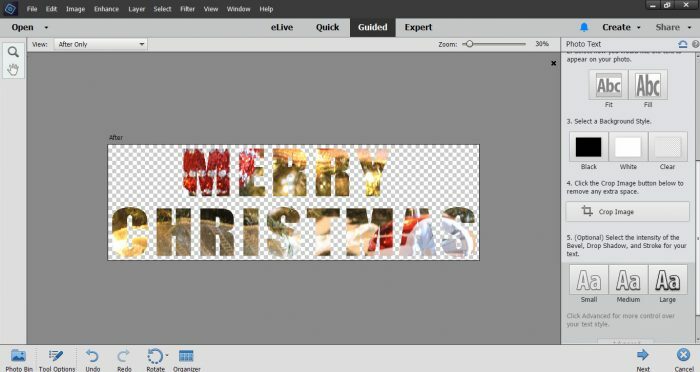 The Guided Edit that I’m going to use for my holiday photo card is Photo Text. Let’s get started. First, open up PSE and choose “Guided” at the top of the screen. Next, open your photo and click on Fun Edits > Photo Text. I’m going to show you how to insert a photo into text, similar to this post. I chose a close up of my Christmas tree for this card. Click on the “Type” tool on the right side of the screen and choose a font from the drop down menu. A big and chunky font such as Impact works well for this project. Type your phrase onto your photo. Once you have typed your text, click the check mark and PSE “clips” your photo to your text. You can now resize and move your text if you want. When you are satisfied with the result, select “Clear” as a background style and also click the crop button to remove any excess space around your text. 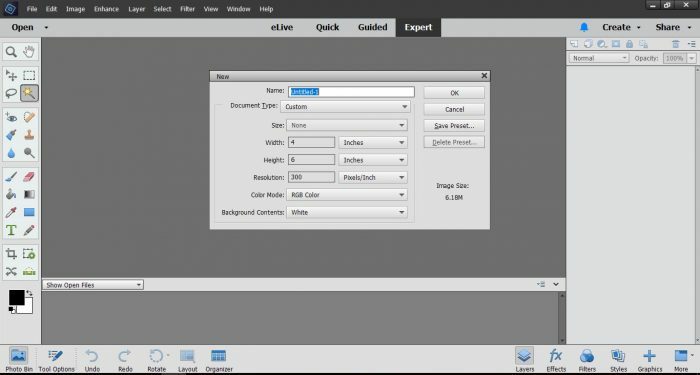 You can also add other effects such as drop shadows and outlines and adjust the saturation by clicking the Advanced button. Click Next to save your image. Now, we’re going to put this text that we created onto a card. To do this, navigate to Expert mode by clicking the “Expert” button at the top of the screen. 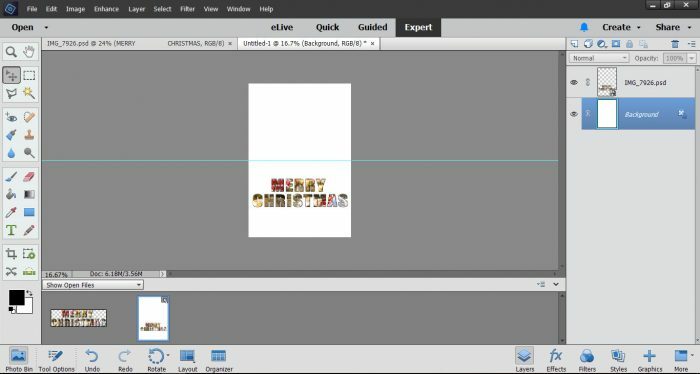 Create a new 4″ x 6″ (or whatever size you want your card to be) file with a white background (File>New) and use the guide tool (View > Guide) to place a horizontal guide at 3 inches. 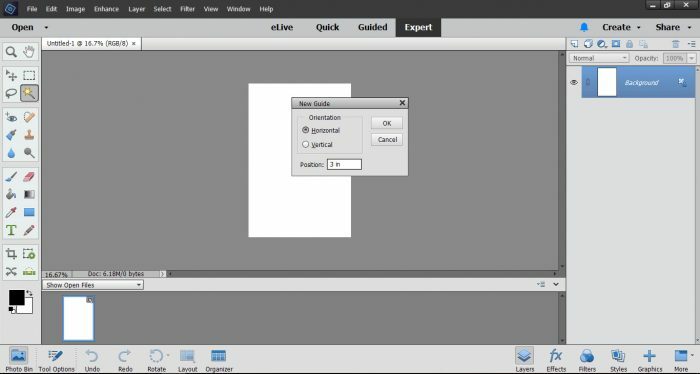 Drag and drop your text that you just created onto your new file, centering it below the guide line. Save your file and print out onto heavy cardstock. Fold in half and you have a beautiful holiday card. Now go get your cards into the mail! How simple is that? The cards look like a million bucks — so high end and designer. I would have never guessed they were so easy to design. Thanks so much, Amy! They really are so simple to make. This looks so easy! I’m feeling totally inspired now! This is so beautiful! Thank you for sharing this information. Okay – this is genius! I have Elements too (and love it). Need to make (yes, I’m behind on my cards)!